Acupuncture is a complex branch of ancient Chinese medicine dating as far back as 2,500 years. This art of medicine revolves around the body’s life force, called Qi. Call us today about an acupuncture treatment plan! This Qi travels down meridians. These meridians are like highways that the Qi moves along throughout the whole body. There are fourteen major channels that flow from the torso to the feet, the arms, the head, and all things internal. Thus, Qi is the vital force in the body, the presence of which separates the living from the dead. Any misdirection, blockage, or other derangement of the amount, flow, or balance of Qi may result in pain, dysfunction, and ill health. Acupuncture corrects these disturbances with precise placements of very fine needles on various points throughout the body. These needles are so thin that about 5 of them can fit inside of a hypodermic needle that you would receive a shot with. 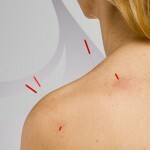 There are many more conditions that can be resolved or improved by acupuncture. Call (615) 751-0958 today and ask about our acupuncture treatment plans.